May 4, 2018 -- Organized by the European Society for Radiotherapy & Oncology (ESTRO), the ESTRO 37 meeting was held in Barcelona, Spain, from 20 to 24 April. Over 100 companies displayed their products in the 5,400-square-meter exhibition. We look at the technology being developed by four emerging players. 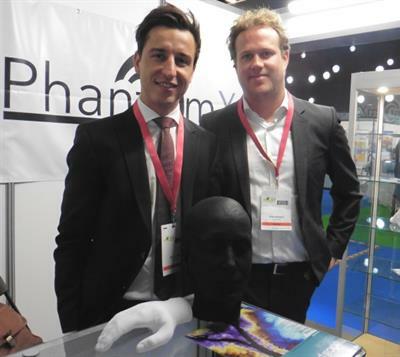 PhantomX, a spin-off from Charité - Universitätsmedizin Berlin, has created a novel 3D printing method that can "copy patients into phantoms." The idea is to create a phantom with exactly the same radiation attenuation as a patient, enabling realistic simulation of their radiation exposure in CT and radiation therapy. The phantoms are created using a two-step process. First, CT images of the patient's anatomy are printed in radiopaque ink on paper, with the CT grayscale used to encode radiation attenuation levels. Then the paper images are stacked into a 3D structure and cut to shape. Following this process, a CT scan of the phantom will be identical to that of the patient. Paul Jahnke (left) and Tetje Dietrich from PhantomX with a head phantom and a hand phantom. One key application is patient-specific radiotherapy quality assurance (QA). Here, a treatment plan is delivered to the phantom on the linac and the resulting dose is measured. The phantoms can also be used to generate realistic CT and x-ray images, to investigate dose and imaging parameters. Finally, they provide a realistic simulation environment for training of medical staff. According to project leader Paul Jahnke, the phantoms could be used for all patient treatments. They are, however, particularly relevant for treatments of younger patients, secondary tumors, head and neck tumors near organs at risk, or patients with comorbidities. Lyon-based Neolys Diagnostics is developing decision-making tools that allow radiation oncologists to adapt treatment according to the radiosensitivity of an individual patient. The aim is to reduce treatment side effects while optimizing efficacy. The toxicity of radiotherapy is dependent upon three factors: the dose delivered to cells, the cell environment (such as the presence of chemotherapeutics), and the radiosensitivity of the patient. "For many years, there have been improvements mostly in the first of these factors, but the individual's radiosensitivity has been completely forgotten," explained Gilles Devillers, the company's president and co-founder. "Still today, 20% of patients receiving radiotherapy have side effects." 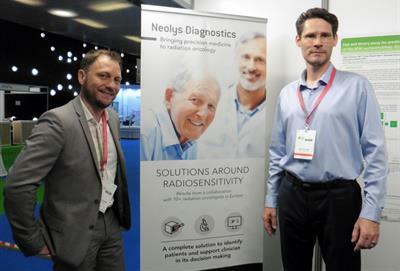 Neolys Diagnostics' CEO Julien Gillet-Daubin (left) and President Gilles Devillers at ESTRO 37. To address this shortfall, Neolys Diagnostics currently offers two test systems. The first, RadioDTect, involves a simple blood test that gives results in four to five hours. Designed to be performed for every patient, at the cancer center, the test identifies whether a patient is at risk of experiencing severe side effects or not. "This test reveals whether a patient is radiosensitive, but it doesn't show to what extent," Devillers explained. To create a detailed map of their level of risk, some patients will require the next step -- RadioProfile. This high-performance test involves a small skin biopsy and is performed in Expert Labs partnering with Neolys Diagnostics. Within two to three weeks, the test will predict exactly which side effects a patient will have and at what level. The tests work by examining DNA repair following radiation-induced double-strand breaks. The number of unrepaired versus repaired breaks (among other markers), identified using immunofluorescence analysis, depend upon the function of the ATM protein in the patient and are a reliable indicator of an individual's radiosensitivity. This allows estimation of the radiation dose that the patient can tolerate without adverse side effects. Devillers notes both tests are CE Marked and that seven additional clinical trials are ongoing. In the next phase of development, Neolys Diagnostics is developing a decision support system that helps clinicians choose the most suitable treatment for their patient, providing justification for a particular modality, such as proton therapy, for example, or hypofractionation. "We are going to bring the missing part of the radiotherapy toxicity assessment," Devillers said. While radiotherapy delivery techniques have undergone enormous advancements in recent years, the reference points used to guide treatment are still created using tattoos. These are painful for the patient and are commonly injected at depths of 2 mm to 3 mm, meaning they remain forever. This permanence can be particularly distressing for patients with several tattoos in prominent locations, such as breast cancer patients, for example. Medical Precision's CEO Annelies Maas demonstrates the painless tattooing system. Dutch start-up Medical Precision has come up with an alternative. Its MPV-16 system, based on technology developed for permanent makeup, uses a tiny needle to inject pigment into the upper dermis. This painless procedure, in which the patient just feels the needle vibration, still creates a highly visible skin mark. Importantly, the mark is not permanent and will disappear six months to a year later -- or it can be removed immediately using a laser. The CE-approved device comes with three color-coded heads, each offering a different injection depth. The smallest-depth needle, for thin skin, penetrates just 0.2 mm into tissue. For darker or thicker skin, a needle that penetrates 0.4 mm can be used. If a permanent mark is required, a 0.7-mm option is available. Even at this depth, the process is still pain-free. NU-RISE of Portugal is developing an in vivo dosimetry system based on fiber-optic probes that are placed inside the patient's body. The probes monitor the level of radiation that the patient is receiving in real-time, helping doctors better target the cancer and protecting patients from unnecessary irradiation. The company's vision is to provide valuable data in real-time for clinical decision support, enabling safer and accurate radiation treatments. "We are working to solve one of radiotherapy's problems -- to know what happens in the patient in real-time," explained Luís Moutinho, NU-RISE's founder and CEO. "Our system can precisely measure the amount of radiation delivered to a tiny volume, usually where organs at risk are, and compare it with the treatment plan." NU-RISE's in vivo dosimetry system. The system uses optical probes, each of which contains at its end a 2-mm section of a material that converts radiation to light. The probes are less than 1 mm in diameter, making them compatible with standard catheters. This makes NU-RISE's dosimeter a great solution for real-time in vivo dosimetry in brachytherapy, where currently no options are available. NU-RISE has also developed a novel method to process the resulting optical signal with minimal noise. According to Moutinho, this allows the probes to cost 10 to 20 times less than other in vivo dosimetry probes. This lower pricing level enables the probes to be disposable. As such, each probe is provided precalibrated, sterilized, and bar-coded, so that each fiber can be easily identified via scanning. The system enables up to six probes to be placed and used simultaneously for each treatment. 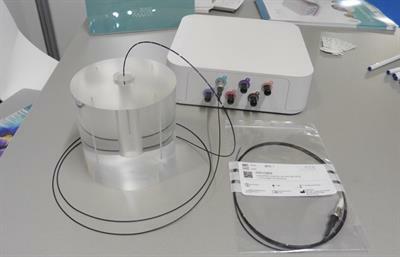 The company is currently working to CE Mark the device, but the dosimetry system is available for use by NU-RISE's clinical partnerships and is already being employed in patients. NU-RISE is also looking for new collaborations and applications of its technology.